Chief Justice John G. Roberts and blogger Achy Obejas both grew up in Michigan City, Ind. My impulse, I confess, is to redeem John Roberts after today’s decision on the Affordable Care Act. I want to thank him for his role in letting stand the law that will very likely be the only reason my family and I have decent healthcare in the future. I turn 56 today, with not a few pre-existing conditions; I freelance for work and have no fixed salary; and my son is only seven months old. I want to say that I knew Roberts would come through in the clutch, that when faced with the kind of life and death choice this decision presented for so many people, that the core values we both learned in the same idyllic Midwestern town were going to come through. Roberts’s dad was an executive at Bethlehem Steel, while many of my friends’ dads worked the night shift. My own parents were public school teachers — my mom, in particular, had a real commitment to the idea of public education as an engine for democracy and mobility. Roberts went to La Lumiere School, an exclusive boys academy so far in the woods that it looked like a fantasy castle. My pals and I went to public school — to various grade schools, Barker and the sparkling new Rogers High (now Michigan City High School). I never met John Roberts growing up, though he’s only one year older than me and, frankly, Michigan City is damn small. I think we must have gone to the same Dairy Queen, must have been at the same parties on Stop 2 at least once, maybe even had a drink or two way before our time up at the old Buffalo Lounge across the Michigan state line where the legal drinking age was 18. I really believe that what John Roberts did today was legally correct, constitutionally solid, but I also think resisting the impulse to exert unprecedented power — and to allow vulnerable, sick people to access this country’s extraordinary healthcare system without going bankrupt in the process — was an act of both courage and decency, both virtues in abundance in our tiny hometown where everybody knew everybody and helped one another in moments of crisis. 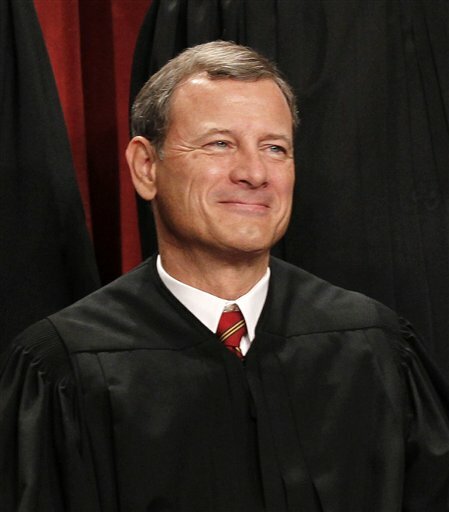 I want to have my little gauzy romance with John Roberts. I want to think that though we both got kissed by the same kindness in our hometown, and that it matters. And to be clear, what Roberts did today was legal hair splitting: He, in fact, agreed with the four conservative justices that the individual mandate did not fall under the interstate commerce clause. What upholds the Affordable Care Act is Roberts’s decision to also agree with the liberals that it is instead a tax, and thus falls within Congressional power to raise taxes for the general welfare. Conservatives are burning Roberts at the stake today just as minority leader Eric Kantor promises to the take the chief justice at his word that this is a legislative matter and bring the issue of healthcare back to our elected leaders: Kantor has scheduled yet another House vote on the Affordable Care Act immediately after the July 4th holiday. It’s pure theater, of course, since it can’t pass the Senate, and President Obama (who, incidentally, voted with VP Joe Biden not to confirm Roberts for the high court) will veto it while dancing a happy jig. All Kantor wants to do is get everyone on the record before November. Me, I’m going to enjoy my birthday today, happy that the Supremes have decided to sing me an Obamacare birthday boogaloo. And as I visit our shared hometown this weekend, I’m going to try and hold some of my warm and fuzzy feelings about Roberts, hoping that rather than an aberration, this is the emergence of a new, thoughtful, decent and generous chief justice, just like our neighbors back on the beachfront in Indiana.